Nomad Adventures operates many affordable seasonal trips in Southern Ontario for people looking for quick easy escapes from the daily grind. If you are seeking a serious adventure into some more remote destinations, we have that too! We have excellent relations with lodge owners and other guide service operators, allowing us to offer great accommodations, services, and local knowledge. Tyler Dunn Guiding in Sault Saint Marie offers spectacular year round fishing experiences in Northern Ontario. Kashaga Lodge in Haliburton is our long standing kayak fishing friendly destination in Central Ontario. County Shores at Telegraph Narrows in Picton is a home base for some stellar Esox fishing in Eastern Ontario. Swift South River is a visitors information and outdoor centre in Near North Ontario. From Sault Saint Marie north and west, we partner to offer the ultimate in fishing and wild Northern Ontario paddling experiences. 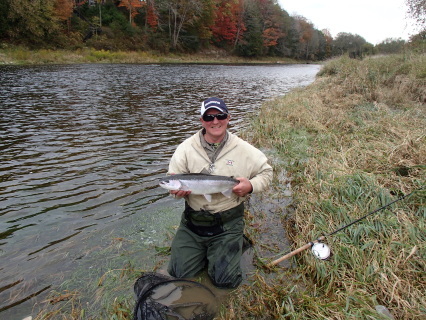 St Mary River Atlantic Salmon, Pacific Salmon and Steelhead. Wade the historic Soo Rapids! Lake Superior Provincial Park for backcountry Brook Trout, Lake Trout and Splake. Kashaga Lodge in Haliburton is a jump-off point for some excellent Bass, Trout and Musky fishing. Lots of glacial lakes with Haliburton's unique strains of Lake Trout, also splake, speckled trout, and rainbow trout too. 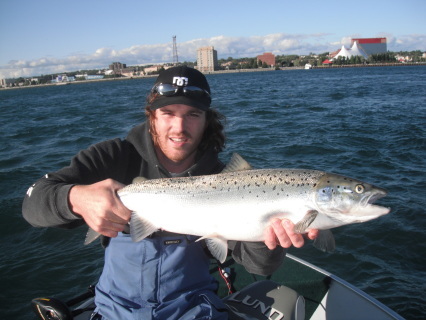 Long known as the "go to" destination for trophy Walleye, the Bay of Quinte offers up so many more great angling opportunities. Northern Pike, Longnose Gar, Largemouth Bass, Smallmouth Bass and of course Sheephead! County Shores offers numerous opportunities for kayak anglers to match their personal best catches. Fish unpressured and little known bass waters where the opportunity for a trophy pike is only a cast away! Trout and Splake trips just outside the west end of Algonquin Park. All Premium Adventures require at least two months to plan, so please inquire early in the year.